How do you get several hundred strangers to hang out and sing songs together, and to cheer on choirs as though they were football teams? It's simple — just add beer. That's the recipe being followed, with great success, by the Twin Cities chapter of Beer Choir. 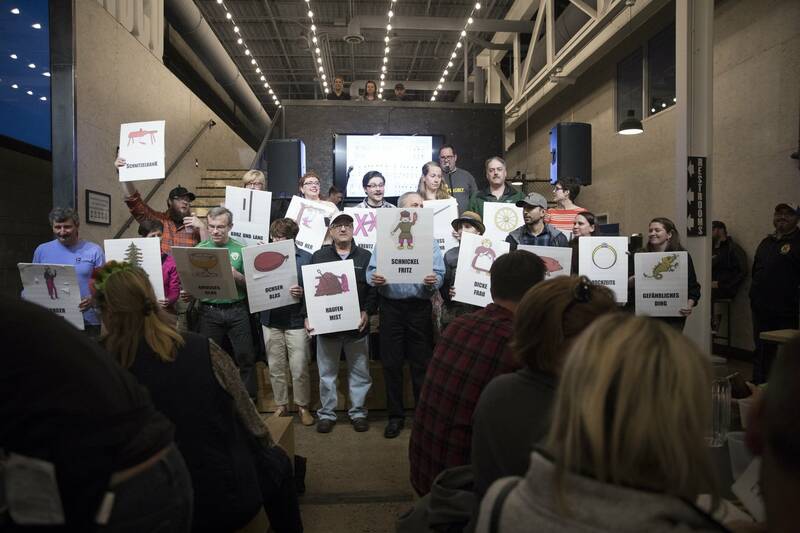 Last Saturday night, the taproom of Inbound BrewCo in Minneapolis was packed for a Beer Choir event. And the crowd was singing, in German. 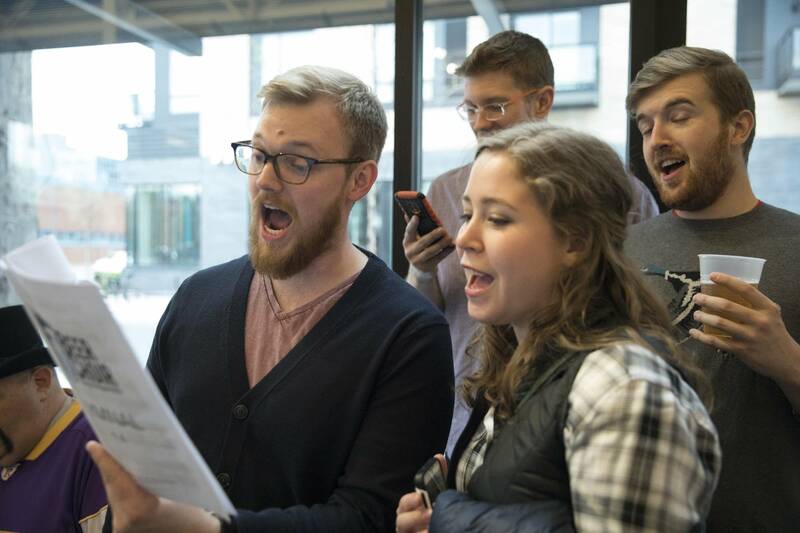 "We need to be singing things together as a community a lot more, for fun," said Adam Reinwald, one of two former members of the Cantus vocal ensemble who head up Beer Choir Twin Cities. 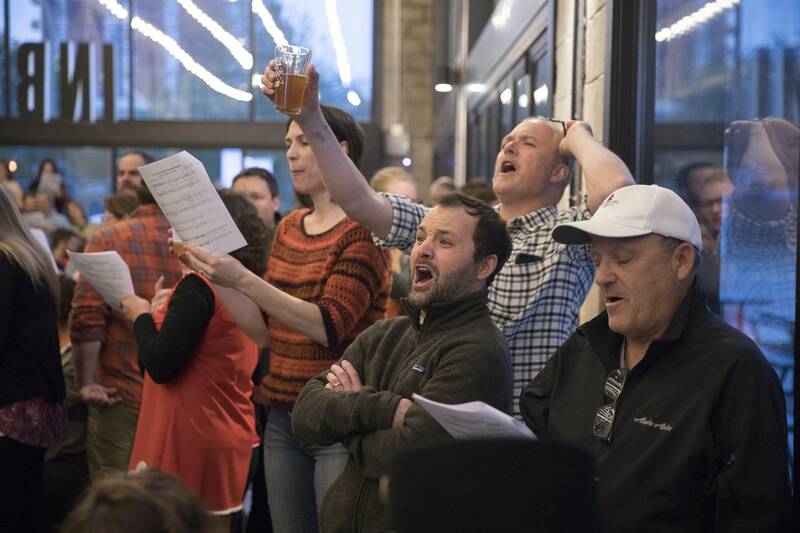 Reinwald, who's now the assistant conductor of the National Lutheran Choir, said Beer Choir is a way to get people to sing without pressure to get it perfect. Anyone who comes into the beer hall is given a hymnal filled with drinking songs, or patrons can download it to their smart phones. At Inbound, the sheet music was also projected up on a screen behind the accompanist. The assumption is that if you're in the beer hall, you're going to sing. 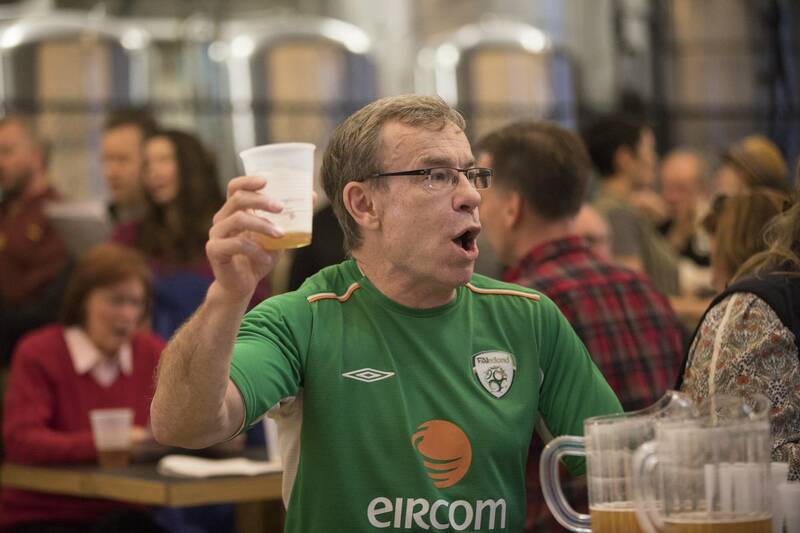 Drinking songs are a centuries-old tradition in Germany and the British Isles, and the people who showed up at Inbound reflect that. Sitting close to the front of the room was 87-year-old Judy Wehrwein, who came with her neighbors. "I love it here! I think it's great fun," she said. Such community sings also happen in her home country of England, she said, "but in England the song would be, 'Knees Up, Mother Brown.'" Beer Choir events are free and serve to promote the work of local choruses. They go by the motto, "Sing responsibly." The Twin Cities chapter launched with a gathering at Summit Brewing in St. Paul last January, said cofounder Paul Wilson. "That was by far the largest Beer Choir event that had ever happened," he said. "We were hoping that maybe a couple dozen of our friends would show up, and then people just started streaming in the doors." 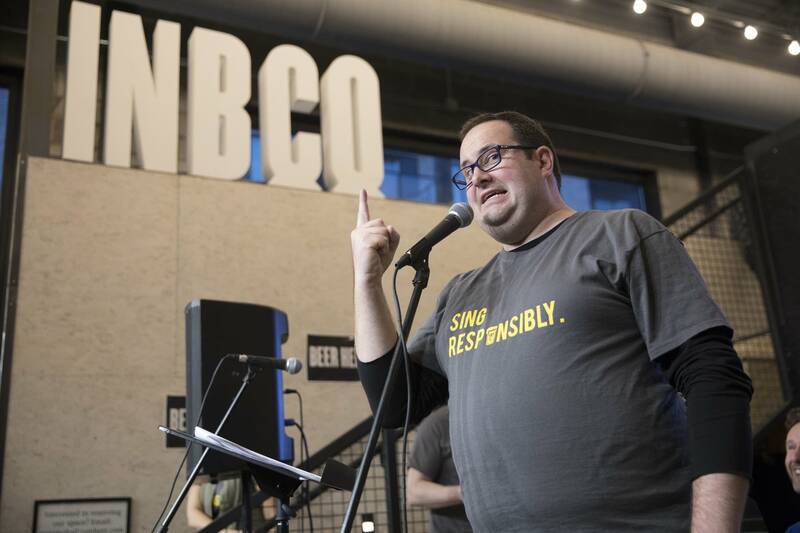 The Twin Cities Beer Choir went straight from being the newest chapter to the flagship for the national movement. It makes sense; Minnesota has a long, strong choral tradition, and the craft beer movement has taken off here in the past few years. And the breweries don't seem to mind. 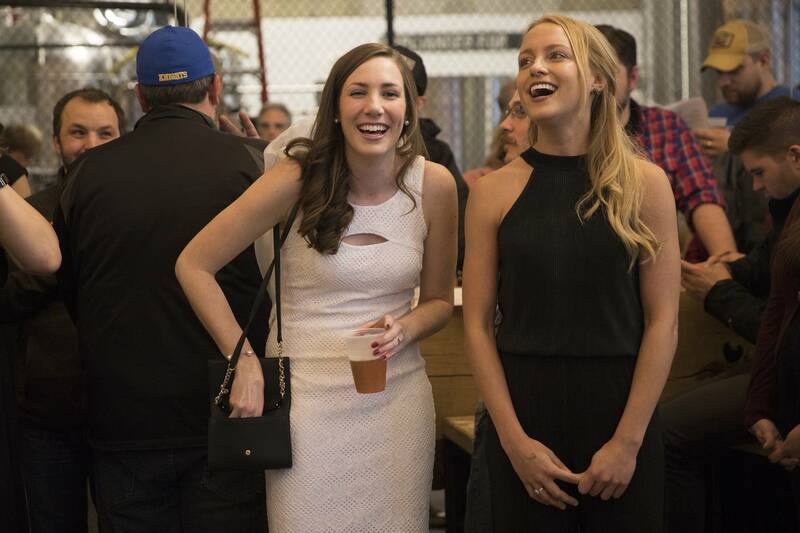 Carey Matthews, Summit Brewing's marketing manager, said her company's community space was modeled after a typical German beer hall, so it was perfectly suited to the raucous event. "It was great," she said. "We were at capacity. Everyone was singing along — it was a perfect fit. ... We'd definitely do it again." Reinwald said there's something special about seeing people from different backgrounds work together on a song and celebrate mastering it. "My favorite takeaway from our first event in January was this gentleman who, after the event, came over and talked to us, and said, 'You know, I was dragged here. I don't like choir. I was really not looking forward to this, and I had a great time.' And there he was, 30 minutes after the event finished, still having a beer with his friends, with a big smile on his face," Reinwald recalled. Beer Choir Twin Cities has yet to plan its next event — interested singers can follow the group on Facebook or Twitter. Wilson said the beer's really just an excuse: "It's really about bringing a community together and doing something positive in a large group that doesn't really happen very often," he said. "And especially bringing strangers together is something that is so rarely done now." Up until now, Wilson and Reinwald have paid for the accompanist and hymnals out of pocket. They're still figuring out how to make Beer Choir Twin Cities financially self-sustaining. But they'll be headed to another tap room in the area sometime soon. Correction (May 2, 2017): A previous version of this story misidentified Judy Wehrwein. The story has been updated.